You’ll have to excuse me today, I think I’ve caught something. No, it’s not exactly that French audio-itis that’s going around—I think I caught that last year. At first, I thought I might’ve come down with Netflix pneumonia or even an immersion infection. But then I opened up YouTube and confirmed what I’ve suspected for a while: I’ve caught something viral. I’ve got a serious case of French viral videos. Fortunately, the symptoms are increased French listening comprehension, an expanded vocabulary and conversation mastery. Can Viral Videos Really Help You Learn French? Okay, okay, so I’m not really sick. But honestly, watching viral videos is one of the most underrated yet best ways to learn French. For starters, watching French viral videos on YouTube is a great way to get used to the sounds and cadences of authentic, conversational French. And because these videos are so often created by young, funny French YouTubers, they’ll expose you to slang and colloquial language that you wouldn’t get from a typical academic French course. Further, many of these videos also link up with French culture—and I’m not just talking fancy cheese and expensive wine and the Eiffel Tower. French viral videos get to the heart of modern-day French culture, often referencing current TV shows, music or other aspects of French pop culture. These videos can give learners an in-depth look at French culture outside of the stereotypes and traditional caricatures. But not all French YouTube videos are equally useful! Videos with subtitles can take your French learning up another level. Why Use YouTube Videos That Have Subtitles? Above all else, subtitles allow viewers to keep up with what’s being said. It sounds obvious, but when watching viral videos, it can sometimes be difficult even for advanced speakers to keep up, due to the fast talking and slang. To that end, subtitles allow learners to practice listening comprehension as well as reading. Come across a word or expression you don’t know? Pause the video and translate. Want to hear the pronunciation of a word more clearly? Rewind and read along. Also, once you’ve watched a video more than once, try toggling the subtitles on and off to practice watching without subtitles. Intermediate and advanced learners should also consider watching with French subtitles as opposed to English—it’s a great way to get out of the habit of translating between languages while building your vocabulary. However, I must warn you: Beware of auto-generated French subtitles. Often, these subtitles make no sense at all and will just confuse learners more. But fear not, all the videos in this list have great subtitles! 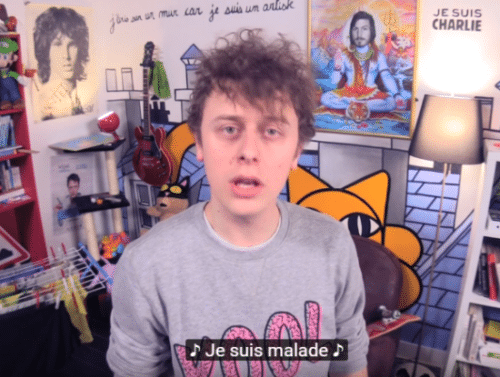 Check out these 10 French YouTube videos with subtitles and get infected with learning too! For those who don’t know, Cyprien is the star of a wildly famous YouTube channel with over 10 million subscribers. His videos are primarily comedy sketches, and he has more than 1.5 billion views! If that doesn’t convince you to check him out, then maybe this video will. It focuses on those little things that annoyed Cyprien about school. It’s one of his most famous videos, and I can see why: It’s absolutely hilarious. This video includes common vocabulary used at school, so it’s a great way to learn words and expressions associated with education as well as plenty of essential, everyday nouns. Subtitles are available in more than a dozen languages including English and French. Natoo is a hilarious YouTuber as well as talented singer. Her video Les gens sales (Dirty People) describes unsavory habits that some (if not most) people have, and she has no problem poking fun at herself. Natoo also jokes about some of the… *ahem* unflattering stereotypes people have for the French. In addition to using current, popular slang, Natoo also uses words that are specific to hygiene and the bathroom. These words will perhaps be very helpful to beginners who are learning how to talk about the world around them in French. Subtitles for this video are available in English and French. Norman fait des vidéos (Norman Makes Videos) is also a famous YouTube channel with 9 million subscribers and 1.4 billion views. Like Cyprien, Norman makes comedy and sketch videos. As you might expect, this video is a humorous look at medical professionals, patients and their behaviors. Furthermore: It’s as hilarious as it is truthful! For French learners, it includes a lot of common vocabulary spanning many domains. You can find a lot of expressions and allusions to French popular culture, and of course, you can also hear specialized vocabulary used by doctors and those in the medical field. For science or linguistics fans, this TEDx Talk “Mais comment font-ils pour apprendre une langue?” (“But what do they do to learn a language?”) is a very interesting explanation of how babies learn languages. How is this applicable to your journey as someone learning French outside of infancy? 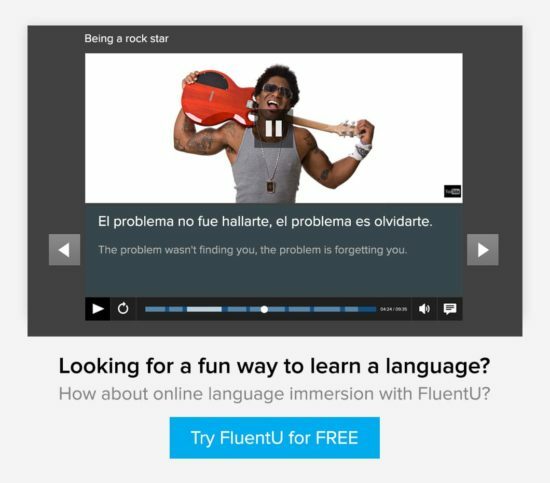 Well, this video also talks about how understanding that process can help adults learn additional languages. There are more academic and scientific words used in this video, so it’s a good option for intermediate learners. The audio is clear, and the subtitles are extremely professional and detailed. Further, aside from being a great tool to practice listening comprehension, this video is useful for anyone seeking tips for learning a foreign language such as French. No, I won’t just *give* you the tips! You’ll have to watch to find out for yourself. BONUS: While you’re at it, check out 70 other TEDx Talks in French and with subtitles! Ce qu’il s’est vraiment passé pendant cette scène (What really happened in this scene) is a collaboration between two famous French YouTubers named Amixem and Sofyan. In essence, the two take scenes from the movie “Titanic,” give their own voice-overs, and the results are hilarious. For French learners, this video is great to learn romantic phrases, even if they’re used jokingly. The English subtitles are fantastic considering the informal speech used (subtitles are available in French as well), and this is truly the kind of video that you can watch again and again and it gets funnier every time! Le Rire jaune (Yellow Laughter) is a YouTube comedy channel created by two brothers of Chinese and Vietnamese descent. They often do videos poking fun at themselves and those around them, and they offer a view into the Asian-French experience. In Les Parisiens (Parisians), the brothers tackle the biggest issues they have with Paris. And when I say “issues,” I mean that there are a couple things the brothers just can’t stand! While a little stereotypical of those who call Paris home, the resulting video is hilarious. Aside from the laughs, this video is great to learn slang that’s specific for young people in Paris and France as a whole, and it offers a glimpse at Parisian culture. Beware, this video is best for upper-intermediate to advanced learners for two reasons: The speech is super fast, and the subtitles are only available in French. For the gamer French learner, check out this YouTuber named Joueur du Grenier (Attic Gamer). His videos often focus on him playing and commenting on video games, but he also makes videos about comics, movies and TV shows. This video in particular focuses on super-héros (superheroes). But these aren’t just any superheroes. Joueur du Grenier talks about some lesser known superheroes in comics and video games that deserve a little bit more recognition. While this video is a little long, it’s perfect for vocabulary that has to do with technology and gaming, and his conversational style is great for building your listening comprehension skills. Subtitles are available in English and French. From YouTuber SEB, Ce mec… dans son lit (This guy… in his bed) is a humorous video that talks about sleeping habits. This is a perfect video for those in the pre-intermediate stage looking for a little bit of a challenge. The subtitles are incorporated into the video rather than scrolling at the bottom of the screen. While not everything is subtitled (don’t fear, 90 percent is! ), there’s useful vocabulary for the bedroom and sleeping that should be familiar to learners. Further, the parts that aren’t subtitled will allow you to really stretch those comprehension muscles. Additionally, SEB’s Ce mec… (This guy…) series also has videos on other subjects from grocery shopping to going to the bathroom. Try them all out! “Exr@ French” follows a group of friends and the funny and heart-warming shenanigans that they become a part of. This series is great for beginners of French because the speech is slow and the subtitles are really accurate. There are also annotations and language learning hints incorporated directly into the episodes. Best of all, once you’ve finished the first episode, there are several more on this YouTube channel for you to enjoy! “Les Parent” (which translates to “The Parents” or “The Parent Family,” since Parent is the family’s last name) is also a TV series available on YouTube. While “Extr@ French” was for beginners, this show is definitely more for intermediate and advanced learners. “Les Parent” follows a family and the comedic yet sweet things that happen to them. Perhaps the most challenging (but useful!) part of this show is that it’s from Quebec. For those who’ve studied Parisian French, it may be a little hard to follow, but the subtitles are fantastic and allow you to learn all the slang associated with Quebec French. Once you get a handle on the unfamiliar words and expressions, it’s a great watch! I’m sorry to break it to you: you’ve been infected. And while you’re bed-ridden, get watching these viral videos!